For many people, this will be the first Christmas without a person who is dear to them. It can be very confusing to try to process your emotions through all of the hubub and celebration. You may feel conflicted because you want to enjoy the parties, food, and other treats, but being around a group of people when you are in the process of grieving can be a hard thing. It is very tempting to not celebrate the holidays at all. You may be thinking, “what’s the point of Christmas without……?” The point is, your loved ones in Spirit would never want you to skip a holiday or have a miserable one because of their passing. They want you to celebrate as you did when they were still here- because they are! 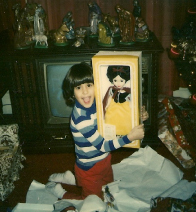 Opening up a Snow White doll from Disneyland- given to me by my grandmother, of course. When my grandmother passed away in July of 1983, my family was devastated. But we had to march on, and everyone knew that. By the time Christmas came around, we had all done some grieving, but it was still hard. I mean, what was Christmas without Gramma? Instead of putting energy into feeling bad, my family honored her by doing what she would have done on Christmas. I am grateful to the adults in my family, who recognized that they couldn’t take away Christmas from us (the kids) because they weren’t in the mood. There were plenty of decorations and gifts, and enough food to feed an army. We were still saddened, but we knew she would never stand for us sitting around feeling sad during the holidays. She’d be the first person to see someone in that kind of a mood and say, “You. Come with me,” and put you to work doing something by her side. My grandmother is one smart lady. Getting up and actually doing something- participating- is the best way to change your state. In Italian culture, everyone pulls together to make the holidays special. Mom and the other female family members bond in the kitchen over time-tested recipes. Dad and the kids put up the Christmas tree. My grandfather is usually standing near the bowl of eggnogg, sneaking in a few drops of whisky thinking no one is watching him. It’s all about family. This Christmas will be the first one I’ll be home for in four years, and my grandmother is working through me to make sure everybody knows she’s going to be there too. As a matter of fact, expect an entry shortly after Christmas about this, because it’s going to be a good one! 1. Please celebrate the holidays as if they were still there with you, because they are! 2. Talk about them! When you do this, you draw their energy close to you. 3. Remember the good times and allow yourself to laugh. No one will judge you for not being solemn enough! 4. Be good to the ones that surround you now. Now is the time to show them how much you care. Don’t wait. 5. There is nothing wrong with reaching out for help. If you or someone you know is having a particularly hard time dealing with a loss this Christmas, I sincerely encourage you to look up a grief counselor or therapist who is trained to help you through this time. Friends and family are well-intentioned and can listen, but a professional knows how to help you. Please don’t feel that this makes you weak in any way. Look at it as a way to help you experience your emotions in a safe place, so you can begin to heal. If you are on the fence about sharing your grief with a professional, think of it this way- Why do you think a person would choose such a profession to work in? Chances are they have once been where you are now, and after having someone else help them through it, they decided to go and do the same for others. You are not alone, so please reach out to someone if you are struggling through the holiday season. So put up the Chrismas tree, hang up the stockings, spike the eggnog and breathe deeply, knowing your loved ones are watching over your festivities this holiday season. Invite them in by talking about them and sharing memories. Most of all, look at each person around you as you sit at the table and recognize that this has been a hard year for a lot of people, which makes having a warm and wonderful Christmas all the more important. Cheers! ~ by healingstarspirit on December 16, 2010.